Yes, we were actually up at 2am this morning and were 4th in the line at the bus stop. Let's all keep in mind here that the buses don't actually start running till 05h30! It was a chilly and boring wait until about 04h30 when The Ageing Aunt, @UselessRob and I headed off for breakfast (we were tag-teaming it to keep our place in the queue). It was the best breakfast selection on offer of our entire trip and it was wasted on us being so early and in a rush. 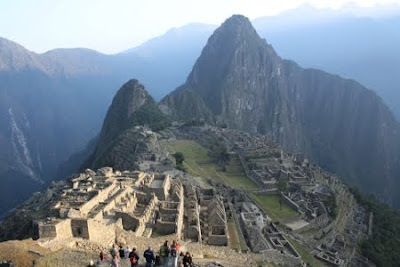 At 05h30 we got onto the first bus and headed up to Machu Picchu. I got stamp number 285 for Huayna Picchu. Unbelievable considering how close to the front of the bus queue we were. We went into Machu Picchu when it opened and walked straight up to Recinto del Guardian (The Guardhouse) and enjoyed the incredible view over the ruins while waiting for the sun to rise and our guide to arrive. I can't explain how breathtaking it is to see in real life. I mean, we've all seen photographs, but there's something indescribable about seeing it in real life. Definitely worth it! I'll say that I'm not 100% on all it's history, even after our guided tour (our guide was the worst we've had this whole trip) but, I do plan on buying Hiram Bingham's book and reading it when I get home. The part I find most incredible is that all of this was only built about 500 years ago! So, we went on a tour round the ruins with a guide and really, experiencing them in real life just made me want to find out so much more when I get home. They are truly incredible. And then came 10am. We'd all been eyeing the mountain towering over us during the morning and seriously beginning to doubt our likelihood of climbing up it. But come 10am with our stamps in hand, we all queued for the climb (except The Ageing Aunt). And we made it. And it was worth it! Honestly, if I hadn't done it myself (in roughly 50mins ... @UselessRob and I took it slow), I wouldn't have believed that the climb took less than an hour because the mountain looks massive, seeing it from Machu Picchu. 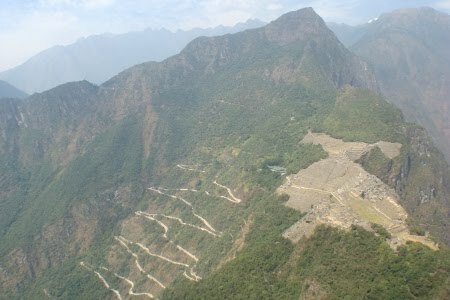 And then, having been amazed by the size of the Machu Picchu ruins when I first saw it from The Guardhouse, I was even more surprised by how tiny it looked from on top of Huayna Picchu! We were exhausted by the time we climbed back down and we headed back to Aguas Calientes for lunch. After lunch we caught a train and then a bus back to Cusco, arriving after 7pm. 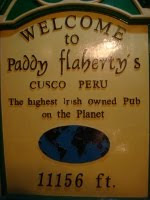 We were exhausted but still had a quick shower and headed out to Paddy's again for dinner and drinks. It was an awesome evening with plenty of laughs and we even met up with our friends from The Lares Trek. It ended up being a rather late evening and The Ageing Aunt and I finally headed home at about half past midnight, after having been awake almost a full 24hrs! What an awesome day. Wow! What a view! It must be amazing to see that IRL. It's somehow impossible to convey the actual magnitude of something that that in a photo, no matter how good the shot is. Can I please just say how much I am loving these Peru posts, especially this one. Also, am dying to know if you hooked up with @uselessrob, but will get gossip in person next time I see you. Seriously impressed at your climb! This is SO on my bucket list. I've always wanted to see the ruins.